Tenerife online with selected shop links where more may be added. First of all, it's not as easy as it may look. Why? Tenerife Internet is improving. We can, already, read most newspapers online and shop for advertising like that but, only in some of German magazines as far as I know. the Teneriffa Anzeiger is one newspaper for advertisement on a broad scale. The problem may be its mainly German readers. Some may understand English, though. That still leaves you. You must be able to understand German to advertise with Teneriffa Anzeiger. Sell real estate, apartment rental, advertise jobs in Tenerife, you offer. Sell online house and garden goods, cars and of course electronic items and more in offers as well as in demand while some of this service is for free. Tenerife online for most Spanish newspapers is available but, I am not aware of any Internet advertisement shopping with them. Here again, you must be a Spanish speaker to create your Tenerife online platform. and pay in the shop. Some time ago, I tried to sell something with the big advertisement paper BAUL in Tenerife which can't be done. However, you can phone the Baul. 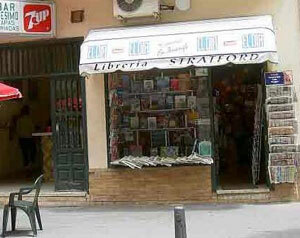 Unfortunately, its Puerto de la Cruz branch doesn't exist any more. Tenerife online with banking is no problem with most financial institutions. Other online advantages for shopping are related to Travel, flights, ferries and cruises, ADSL broad band and insurances. Corte Ingles online is for buying almost everything which even includes food besides fashion, home, sports ware, electronics and everything for the kitchen, literature, travel you name it. Purchases over a value of €50 are delivered free of charge. Electronic goods which come with guaranties such as at Visanta Tenerife may be bought in the Internet while the store comes recommended by almost all tourist resources. Good information with a personal experience with this great shoe shop in Tenerife shopping Puerto Cruz, information of which gather, by clicking here. Local Tenerife or Spanish wines, expensive Cerrano ham and concentrated health products are available in online shops Spain. However, all Internet sites seem to be in Spanish, only. To order groceries in the Internet is mainly possible in Tenerife by making arrangements personally in the supermarkets prior to online shopping. Buying online is an option at Mango in Spanish where photos might explain enough. Many Tenerife companies which sell something only provide the bar minimum of information online which is often less than given by fliers which used to be highly popular in Tenerife but, went into regression lately. Gift shopping online for friends and family overseas. Zara shopping online men and woman fashion My daughter bought me a Zara bag online in 2014 while she stayed in the UK. I could fetch it nicely wrapped in a carton at my nearest Zara shop at la Villa Alcampo in Tenerife. Find Tenerife online revolutionary, best Spain fashion for the young and young at heart at Stradivarius Spanish women clothes, girl dresses, tops, pants, accessories. From Tenerife online back to shopping in Tenerife... which is done the Latin way in the capital which means with less stress in the biggest of all Canary Islands.